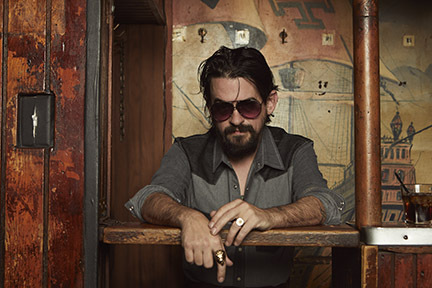 Shooter Jennings’ career is accentuated by shifts in style and retro flashbacks that eventually led to his latest album, Shooter. An homage to 1970s-1980s country music, he returns to work with Grammy-winning co-producer and Nashville Local 257 member Dave Cobb who produced Shooter’s early albums. Of the appropriately self-titled album, he says, “It just felt like, out of all of the records, it was the center, kind of the most simplistic version of the music I make—and it’s like turning a page.” From his start growing up in Nashville to seeking fame and fortune as a rock star in LA, he’s come full circle to the first music he ever heard. Promos for the new album, like many of the Local 47 member’s projects, are punctuated by references to pop culture from the 1980s. “Hey Shooter” variety show promo videos introduce songs with skits that mimic scenes from Hee Haw and close with a parody of the Freedom Rock commercials. Born in 1979 to country music legends Waylon Jennings and Jessi Colter, Shooter says, “I had great parents; my mom and dad were very close and I had a fun childhood. We traveled all the time.” He recalls spending time on the road with the families of The Highwaymen, legends Willie Nelson of Local 433, Kris Kristofferson of Local 257, and Johnny Cash. Having parents who were seasoned musicians also meant Shooter’s eyes were open to the possible pitfalls of the industry. As soon as he decided he wanted to pursue a career in music, Shooter joined Nashville Local 257. That journey began with Shooter leaving for LA at age 20. “You either went to New York or LA, if you wanted to play rock and roll back then. A lot of my favorite musicians were here—I was a big fan of Marilyn Manson, Nine Inch Nails, Guns N’ Roses, Rage Against the Machine, Tool, and Danzig,” he says. In LA, Shooter launched the rock band Stargunn, and over the next three years built a loyal following. Local 47 member Tom Morello of Rage Against the Machine became a friend and mentor. “He started coming to our shows,” says Shooter. “I remember talking to him when my band wanted me to fire our manager,” says Shooter. “I didn’t want to let the manager go because I loved the guy. The band thought we should get some superstar manager. Tom gave me an analogy: ‘Rock and roll is like a hotel and it kind of doesn’t matter what floor you are on.’ He said, ‘You just need to find people you can trust.’” Morello also helped Shooter with songwriting and arranging and produced the band’s early EPs. In 2005, he released his debut solo album, Put the “O” Back in Country with Universal and its hit single “4th of July.” Electric Rodeo (2006) and The Wolf (2007) followed. The compilation Bad Magick: The Best of Shooter Jennings and the .357’s was Shooter’s last release before he left Universal. He founded his own Black Country Rock Records label and released a drastically different project in 2010. The dystopian concept rock album Black Ribbons (2010) included dialogue and narration by writer Stephen King. The next two albums—Family Man (2012) and The Other Life (2013)—returned to a country sound. Countach (For Giorgio) (2016) was a nod to the 1980s film compositions and electronica of Giorgio Moroder. Given his attraction to the studio, it’s not surprising that Shooter has developed a very successful parallel career as a producer. He teamed up with old friend Dave Cobb to produce Brandi Carlile’s 2018 release By the Way, I Forgive You, which was nominated for six Grammys this year. It was after working together on Carlile’s album that Shooter decided to make Shooter with Cobb. “We really learned how to do this together back in the day. He’s the kind of old friend where I might not see him for a long time, but then we get in a room together and it’s like no time has passed—and that’s how we are musically as well. We had a great time making this record,” says Shooter. “I’ve got a bunch of records that I’m producing for 2019. A Duff McKagan [Guns N’ Roses] record that we’ve worked on all year is going to come out. It’s an awesome record and totally not what people expect from him,” says Shooter who is also working with Carlile to produce a new Tanya Tucker album.